Nancy Pelosi is the Democratic Leader of the U.S. House of Representatives for the 115th Congress. From 2007 to 2011, Pelosi served as Speaker of the House, the first woman to do so in American history. As the Democratic Leader, Pelosi is fighting for bigger paychecks and better infrastructure for America’s middle class families. In 2013, she was inducted into the National Women’s Hall of Fame at a ceremony in Seneca Falls, the birthplace of the American women’s rights movement.For 30 years, Leader Pelosi has represented San Francisco, California’s 12th District, in Congress. She has led House Democrats for more than 12 years and previously served as House Democratic Whip. 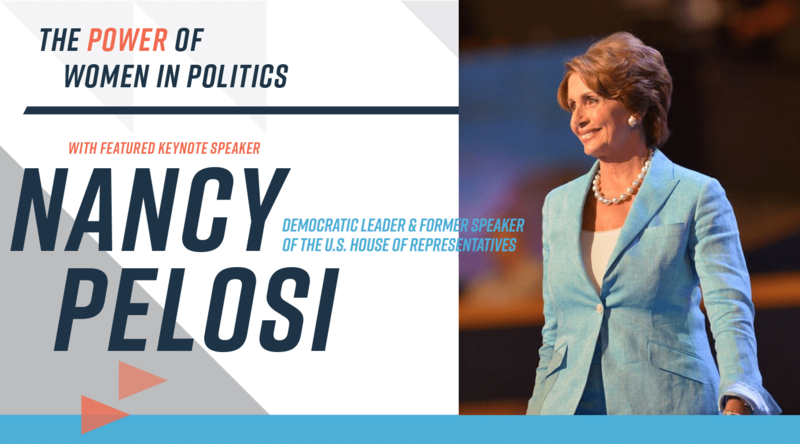 This fall join us as we welcome, Former Speaker of the House Nancy Pelosi who will speak about the power of women in politics, and importance of women at all levels of the political structure. VIP ticket purchase includes admission to the VIP cocktail reception and a photo op with Nancy Pelosi.